Amazingly cheesy Gnocchi cream sauce with bacon for my Italian homemade Potato Gnocchi. Love this gnocchi sauce recipe so much, I don’t make any other cream sauce for gnocchi at times! The other day I shared my homemade Potato gnocchi recipe. The dough is a potato dough, the kind which is common in North Italy, Austria, Switzerland, Germany, Croatia, and Slovenia (among other neighboring countries). 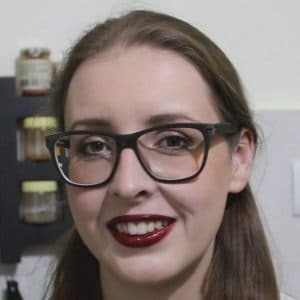 I showed you my three shape ideas for the gnocchi in my video and I did mention that you could freeze the gnocchis after having boiled the dumplings. So, if you are in a hurry you can just defrost the gnocchi and make this sauce! Of course, fresh gnocchis are all the way better, especially when tossed in a homemade cheesy gnocchi cream sauce! The ingredients to make this flavorful gnocchi cream sauce include a sharp Parmesan Cheese and with that I mean the real Parmesan. In the US it’s called the Italian way, Parmigiano Reggiano, anywhere else in the world you can be sure that Parmesan means real Parmesan. Use quality cheese only! For the Cheddar use a real sharp cheddar or you can substitute it too with Gruyere cheese or Raclette. The cheese is the star in this sauce and the bacon is just the one to accompany the cheese, to add a little element of meat. The cheese gnocchi cream sauce was originally inspired by my former Italian bosses recipe. I used to work at a Gelateria as a teenager when I wasn’t studying, and my boss would cook us North Italian meals from scratch. He would never take more than an hour because, well, he had ice cream to prepare! My boss would make his cheesy cream sauce differently, He would add Speck bits, not bacon and a lot of authentic Parmesan Cheese, which he would bring back from around Venice (where he came from). There was no Cheddar in it, that’s my touch up the gnocchi sauce recipe. Speck is a local ingredient in Austria and North Italy (and neighboring countries). It’s easier to come by Speck then Bacon over there. Speck is also known as Lard in some places and that’s not just pork fats but also meat. I chose regular bacon this time for this gnocchi sauce, however, if you get around thinly cut Speck, I suggest you use that instead. Whichever you pick, bacon or Speck, the choice is up to you. I prefer the sauce with thinly cut soft “Gourmet” Speck because the flavor is more intense and you don’t need to cook the soft Speck. Just add the pieces at the end to the sauce. In Austria, you get different qualities of Speck. There is also a tougher version which is more like Bacon and that can be bought cut in cubes. This variety of Speck would need some frying just like the bacon because the fats are chewy. Rule of thumb, if the fat is chewy, cook it, if the fat melts in the mouth, no need to cook it. The advantage of using cooked fats on bacon/Speck is that the meat gets crispy which adds another texture dimension to the gnocchi sauce. 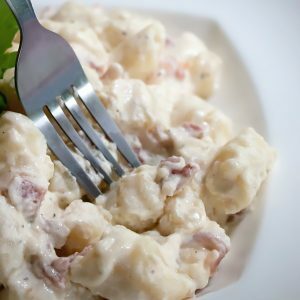 How to make the cheesy Gnocchi Cream Sauce with Bacon? 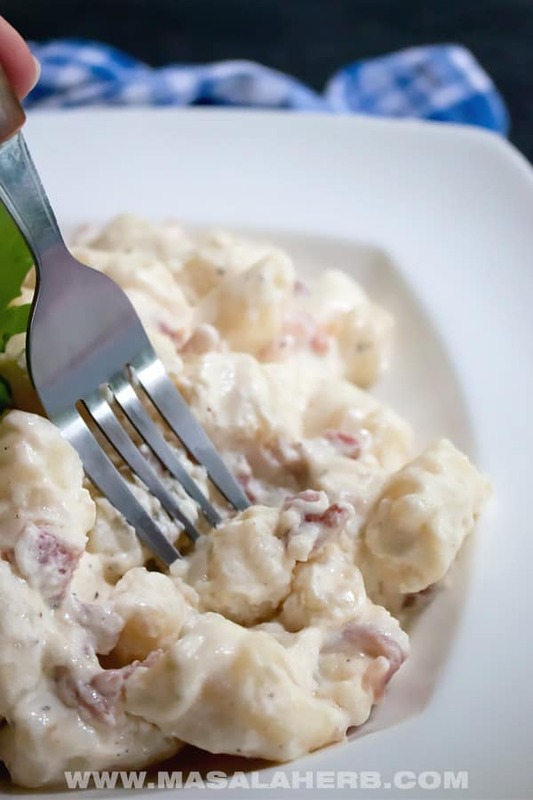 To make this cheesy Gnocchi Cream Sauce with Bacon you will need common kitchen utensils. I like to use a non-stick PFOA-free Pan or some other kind of non-stick pan (such as these ceramic pans) because I like to use less oil in my food and non-stick gives me the option. Otherwise, I also like to use stainless steel pans but if you use stainless steel, make sure to keep an eye on the bacon, so that it doesn’t stick in the pot or burns. So, don’t just turn around for a minute. The Gnocchi cream Sauce is a quick one-pot, I will come together within 10 minutes and it’s Gluten-free because I don’t add any flour to thicken the sauce. Cheese potato gnocchi cream sauce with parmesan, cheddar, and bacon to create (in my opinion) the best gnocchi sauce. This sauce serves 4. This gnocchi sauce and the homemade gnocchi are part of my meal prep weekly menu. Add the oil to a pan, heat up. Throw in your cut bacon in the pan and fry until the bacon has turned crisp. Then pour in the cream and mix the content. Add in the grated Cheddar and Parmesan cheese. Let the sauce cook for 2-3 minutes, as it will thicken quickly. Now you can add your cooked gnocchi and toss them into the sauce so that all the gnocchi are covered with the sauce. Use quality cheese and bacon/Speck only! Dear Reader, do you make your own Gnocchi or buy Gnocchi? The gnocchi cream sauce recipe is awesome. I will surely try this. As this is gluten-free and easy to make, I believe it will be a favorite of many food lovers. Homemade gnocchi is such a treat, we love it with gorgonzola cream sauce, but your sauce would be a good contender! Our gnocchi recipe does not include eggs but I have seen many that do. We got into the habit of making our own and now my husband doesn’t want to order it in a restaurant because ours tastes better! Hi, this may be interesting you: Cheesy Gnocchi Cream Sauce with Bacon!